Product Description DISCOVER DJ is the easiest way to become a DJ. This computer-DJ package is perfect for anyone from people wanting to be a DJ to music lovers who have never tried DJing before. The DJ system harnesses the processing power of your Mac or PC and enables you to DJ parties, events and even clubs using the music that is already on your computer. DISCOVER DJ consists of a hardware DJ control surface with a convenient, standard USB connection and powerful MixVibes CROSS LE performance DJ software. The easiest way to become a DJ. Click to enlarge. USB-powered controller works with Mac and PC computers. View control surface. Click to enlarge. You can mix and scratch your music, including your iTunes Music Libraries using two large performance platters and a central mixer section with a crossfader, buttons and knobs. 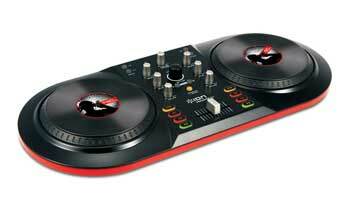 DISCOVER DJ is laid out in to carefully recreate the two-decks-and-a-mixer setup that professional DJs prefer. 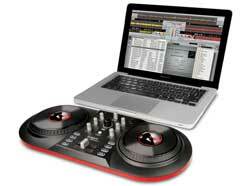 On screen, the MixVibes CROSS LE software is a virtual extension of the DISCOVER DJ hardware, with two decks. Just load your tracks to either Deck A or Deck B, and then control it, cueing up the start point, performing advanced transitions and even scratching. DISCOVER DJ has complete DJ controls such as pitching the music up and down so you can perfectly match the tempo or BPM between tracks and create seamless mixes. 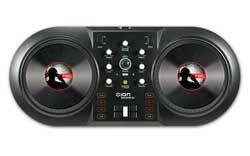 The system also has an automatic beat-matching feature that takes the guesswork out of this tricky piece of DJing. Bass and treble control enable you to shape your sound with ease. You can easily extend the mix by looping your favorite parts of their tracks. Yet, with all of this power and capabilities, DISCOVER DJ is easy enough for virtually anyone to learn on. You can even record, play back and share your performances thanks to recording capability. DISCOVER DJ works with Mac and PC computers. Its hardware component connects via USB and does not require a power adapter.